NEW YORK, September 18, 2017 /3BL Media/ - The United Nations Global Compact will release its 2017 Progress Report today. 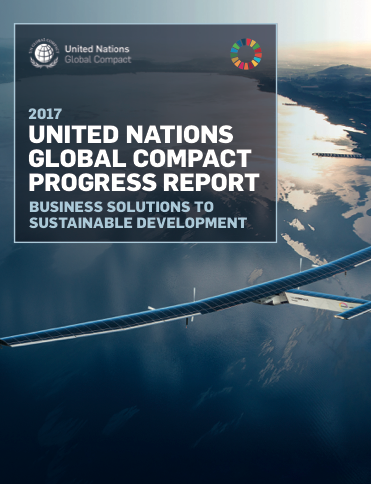 The report includes findings from a 2017 survey of the 9,500 companies participating in the UN Global Compact, showing how businesses are embedding the Ten Principles in their operations to align with the universal values of the UN and detailing how businesses are contributing to the UN Sustainable Development Goals (SDGs). Importantly, the Progress Report confirms that 75% of companies who join the UN Global Compact initiative are taking action relating specifically to advancing the SDGs — demonstrating clear global private sector support for sustainable and responsible business practices. 69% of respondents report that their CEOs are involved in developing and evaluating sustainability policies and strategies. Board involvement has strongly increased by 28% since 2015 to 47%, indicating that sustainability is rising to the top of the strategic agenda in more and more companies. More than 90% of companies now have policies and practices in place in these areas. The number of companies that monitor and evaluate labor rights performance has grown to 53% in 2017 from 44% in 2008. The report has been produced in collaboration with DNVGL Group. The 2017 Progress Report will be released today, 18 September 2017, at the inaugural CEO Roundtable of the UN Global Compact taking place at Headquarters of the United Nations in New York during the 72nd Regular Session of the UN General Assembly. The CEO Roundtable is a strategic, closed-door forum limited to CEOs and UN leadership, including UN Deputy Secretary-General Amina J. Mohammed and UN Global Compact CEO & Executive Director Lise Kingo, to take stock of business progress on the 17 SDGs and review priorities, fill emerging gaps in meeting the SDGs, and agree on means to accelerate overall efforts. Invited chief executives are from companies who participate in the UN Global Compact initiative and have committed to the Ten Principles, while also showing a strong level of commitment to achieving the Global Goals. Sectors represented will include technology, financial services and manufacturing, among others.